Product certification of building products with CE marking is done by a Declaration of Performance (DoP), rather than a test report. Firetect® products are certified AND classified according to ETAG, at present on a voluntary basis until the EN code is transformed in a harmonised (hEN) norm for this type of building products. 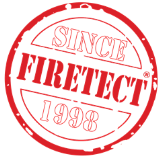 Firetect is EN tested and is in full compliance with European Building Codes and Regulations. THINK STRUCTURAL ELEMENTS; USE A FIRE RATED SYSTEM! Firetect is a fire rated SYSTEM; it has been tested and certified as such and has an extensive field op application. This compact range of building products offers practical and -above all- PROVEN fire resistant solutions for nearly every structural element. Based on common practice, KLF regularly conducts new fire research. The field of application of Firetect® products is impressively extensive and is continuously finetuned for enhanced product performances & installation methods! All general information can be downloaded directly. On site, it's often non-standard! Please contact us for principe drawings for your specific application.